You know those magical books that grab you by the eyeballs and don’t let go? Welcome to the most recent one I’ve found. When I saw that Melissa A. and Cindy had both read and really connected with "Firefly Lane" by Kristin Hannah, I decided to hop on the bandwagon and read it too. Little did I know I’d lose an entire weekend to that book. Literally. I checked it out of my local library after my pilates class on Saturday at about 12:30 p.m. I was done it by 4 p.m. on Sunday, and promptly drove over to my Mom’s house, dropped it into her hands and said, "Here. Read this now." A lot of books try to have a lasting message; something that will stick with you weeks after you’ve closed the back cover and put the book back on your shelf (or handed it reluctantly back in to the library). Kristin Hannah’s "Firefly Lane" really delivers. It’s so easy to get schlocky and sticky sweet with the "live each day to its fullest because you never know when it will be the last" message, but Hannah’s novel does it poignantly and carefully. She never gets to the saccharine stage, instead keeping the book moving along until the very end with real characters and situations that keep leaping off the page at you, forcing you to wonder if you’d react the same way as either Kate or Tully do in the book. 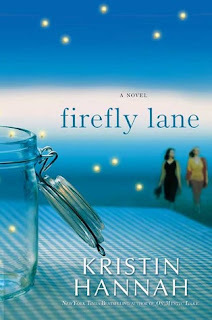 "Firefly Lane" opens with Kate Mularkey feeling like most eighth grade girls do at one point or another: like a loser. She’s accepted her status as the bottom of the great big pond that is middle school, and really wishes her mother wouldn’t push her to put herself out there and make some friends. She’s trying to be happy just the way she is. Then Tully moves in across the road. Tully is everything that Kate isn’t. She’s cool. She’s popular. She seems far older than her years. And eventually we learn that Tully has a secret that’s tearing her apart inside. After an awkward night of stilted confessions and whispered conversation, Kate is astounded to learn that Tully actually wants to be her friend. By the end of the summer, the two of them are TullyandKate: inseparable. This book is the journey of those two halves that make up so much more than a whole. It’s a story about growing up, finding your feet, and ultimately about the betrayal that blows apart a once seamless friendship. This book is so much more than just a book about two girls growing up. It’s about trust, friendship, and why learning who you are is so important. It’s about the reason that you can’t stop smiling when your best friend phones you, no matter what’s happened in your life that day. It’s about knowing who you can lean on, no matter what, and discovering that no matter how accomplished you are, there will come a day when you can’t do it all yourself. Everybody needs someone. There’s no shame in saying, "Help me, please." "Resounding" is the best word that I can think of to describe this book. I’ll be picking up a copy for myself very soon, and probably copies for my sisters and for some friends. It’s not often that a book has this kind of impact on me, and I, for one, would like to personally thank Ms. Hannah for getting this one down on paper. Amazing writing, smooth flow of words, and a phenomenal story that not only will stand the test of time, but that will definitely be re-readable, again and again. This was the first Kristin Hannah book that I read--I loved it. It was such a great book! Great review! I read the book, closed it, and while wiping my tears, drove to the bookstore, bought a copy for my bff, wrote a little note in it and went to the post office to mail it out...Still looking ridiculous..tearing up...sniffling..oh man. Those characters and that story stuck with me for weeks, and remain in my heart..always. Firefly Lane is one of my favorite books. I agree -definitely re-readable.